A call option, commonly referred to as a “call,” is a form of a derivatives contract that gives the call option buyer the right, but not the obligation, to buy a stockStockWhat is a stock? An individual who owns stock in a company is called a shareholder and is eligible to claim part of the company’s residual assets and earnings (should the company ever be dissolved). The terms "stock", "shares", and "equity" are used interchangeably. or other financial instrumentFinancial AssetsFinancial assets refer to assets that arise from contractual agreements on future cash flows or from owning equity instruments of another entity. Financial instruments refer to any contract that gives rise to a financial asset to one entity and a financial liability or equity instrument to another entity at a specific price – the strike price of the option – within a specified time frame. The seller of the option is obligated to sell the security to the buyer if the latter decides to exercise their option to make a purchase. The buyer of the option can exercise the option at any time prior to a specified expiration date. The expiration date may be three months, six months, or even one year in the future. The seller receives the purchase price for the option, which is based on how close the option strike price is to the price of the underlying security at the time the option is purchased and on how long a period of time remains till the option’s expiration date. In other words, the price of the option is based on how likely, or unlikely, it is that the option buyer will have a chance to profitably exercise the option prior to expiration. Usually, options are sold in lots of 100 shares. The buyer of a call option seeks to make a profit if and when the price of the underlying asset increases to a price higher than the option strike price. On the other hand, the seller of the call option hopes that the price of the asset will decline, or at least never rise as high as the option strike/exercise price before it expires, in which case the money received for selling the option will be pure profit. If the price of the underlying security does not increase beyond the strike price prior to expiration, then it will not be profitable for the option buyer to exercise the option, and the option will expire worthless, “out of the money”. The buyer will suffer a loss equal to the price paid for the call option. Alternatively, if the price of the underlying security rises above the option strike price, the buyer can profitably exercise the option. For example, assume you bought an option on 100 shares of a stock, with an option strike price of $30. Before your option expires, the price of the stock rises from $28 to $40. Then you could exercise your right to buy 100 shares of the stock at $30, immediately giving you a $10 per share profit. Your net profit would be 100 shares, times $10 a share, minus whatever purchase price you paid for the option. In this example, if you had paid $200 for the call option, then your net profit would be $800 (100 shares x $10 per share – $200 = $800). Buying call options enables investors to invest a small amount of capital to potentially profit from a price rise in the underlying security, or to hedge away from positional risksRisk and ReturnIn investing, risk and return are highly correlated. Increased potential returns on investment usually go hand-in-hand with increased risk. Different types of risks include project-specific risk, industry-specific risk, competitive risk, international risk, and market risk.. Small investors use options to try to turn small amounts of money into big profits, while corporate and institutional investors use options to increase their marginal revenuesMarginal RevenueMarginal Revenue is the revenue that is gained from the sale of an additional unit. It is the revenue that a company can generate for each additional unit sold; there is a marginal cost attached to it, which is to be accounted for. and hedge their stock portfolios. How Do Call Options Work? Since call options are derivative instruments, their prices are derived from the price of an underlying security, such as a stock. For example, if a buyer purchases the call option of ABC at a strike price of $100 and with an expiration date of December 31, they will have the right to buy 100 shares of the company any time before or on December 31. The buyer can also sell the options contract to another option buyer at any time before the expiration date, at the prevailing market price of the contract. If the price of the underlying security remains relatively unchanged or declines, then the value of the option will decline as it nears its expiration date. Call options allow their holders to potentially gain profits from a price rise in an underlying stock while paying only a fraction of the cost of buying actual stock shares. They are a leveraged investment that offers potentially unlimited profits and limited losses (the price paid for the option). Due to the high degree of leverage, call options are considered high-risk investments. Investment banks and other institutions use call options as hedging instruments. Just like insurance, hedging with an option opposite your position helps to limit the amount of losses on the underlying instrument should an unforeseen event occur. Call options can be bought and used to hedge short stock portfolios, or sold to hedge against a pullback in long stock portfolios. The buyer of a call option is referred to as a holder. The holder purchases a call option with the hope that the price will rise beyond the strike price and before the expiration date. The profit earned equals the sale proceeds, minus strike price, premium and any transactional fees associated with the sale. If the price does not increase beyond the strike price, the buyer will not exercise the option. The buyer will suffer a loss equal to the premium of the call option. For example, suppose ABC Company’s stock is selling at $40 and a call option contract with a strike price of $40 and an expiry of one month is priced at $2. The buyer is optimistic that the stock price will rise and pays $200 for one ABC call option with a strike price of $40. If the stock of ABC increases from $40 to $50, the buyer will receive a gross profit of $1000 and a net profit of $800. A call option is covered if the seller of the call option actually owns the underlying stock. Selling the call options on these underlying stocks results in additional income, and will offset any expected declines in the stock price. The option seller is “covered” against a loss since in the event that the option buyer exercises their option, the seller can provide the buyer with shares of the stock that he has already purchased at a price below the strike price of the option. The seller’s profit in owning the underlying stock will be limited to the stock’s rise to the option strike price but he will be protected against any actual loss. A naked call option is when an option seller sells a call option without owning the underlying stock. Naked short selling of options is considered very risky since there is no limit to how high a stock’s price can go and the option seller is not “covered” against potential losses by owning the underlying stock. When a call option buyer exercises his right, the naked option seller is obligated to buy the stock at the current market price to provide the shares to the option holder. 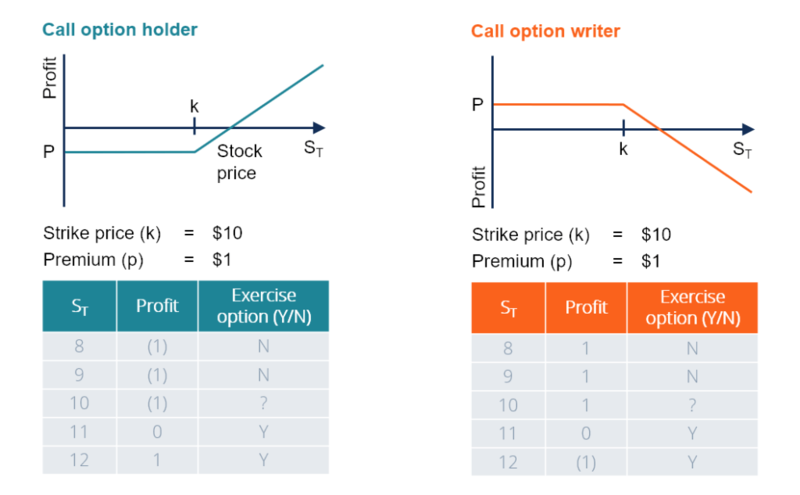 If the stock price exceeds the call option’s strike price, then the difference between the current market price and the strike price represents the loss to the seller. Most option sellers charge a high fee to compensate for any losses that may occur. A call and put option are the opposite of each other. A call option is the right to buy an underlying stock at a predetermined price up until a specified expiration date. On the contrary, a put option is the right to sell the underlying stock at a predetermined price until a fixed expiry date. While a call option buyer has the right (but not obligation) to buy shares at the strike price before or on the expiry date, a put option buyer has the right to sell shares at the strike price. Buying on MarginsBuying on MarginMargin trading or buying on margin means offering collateral, usually with your broker, to borrow funds to purchase securities. In stocks, this can also mean purchasing on margin by using a portion of profits on open positions in your portfolio to purchase additional stocks.